Sunset Healthcare Solutions aims to be more than a manufacturer that provides high-quality, affordable respiratory supplies. We want to help our customers grow their patient base, increase their profitability, and raise their overall brand recognition. To assist with this effort, Sunset is pleased to offer a private-labeling program for all of our customers. We will work with you to customize a layout, which can include your logo, phone number, website, address, and reorder information. This program provides an effective method for promoting overall brand awareness for your business, while giving your patients easy access to your contact information. 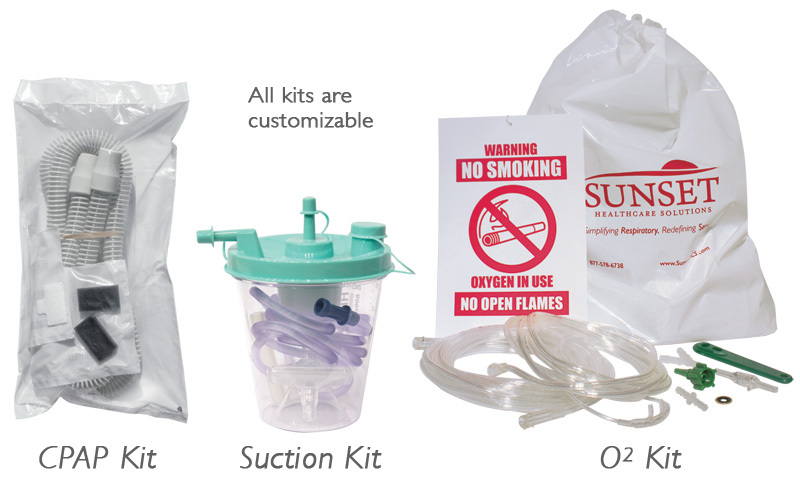 Sunset Healthcare Solutions is proud to offer the most flexible packaging options in the respiratory industry. We realize that each of our customers works differently to fulfill their patients' needs. With this in mind, we have created a series of "Sunset Kits". As shown on our Products page, these kits include various filters, pack counts, and accessories, and have been featured in HME News. For customers that require even further specialized packaging, Sunset will completely customize their orders. Whether the preference is an individual pack count or bulk shipments, we will find a solution that fits the needs of your company.